The #1 International Bestseller New York Times BestsellerThis beautiful, illuminating tale of hope and courage is based on interviews that were conducted with Holocaust survivor and Auschwitz-Birkenau tattooist Ludwig (Lale) Sokolovan unforgettable love story in the midst of atrocity.The Tattooist of Auschwitz is an extraordinary document, a story about the extremes of human behavior existing sid… e by side: calculated brutality alongside impulsive and selfless acts of love. I find it hard to imagine anyone who would not be drawn in, confronted and moved. I would recommend it unreservedly to anyone, whether theyd read a hundred Holocaust stories or none.Graeme Simsion, internationally-bestselling author of The Rosie ProjectIn April 1942, Lale Sokolov, a Slovakian Jew, is forcibly transported to the concentration camps at Auschwitz-Birkenau. When his captors discover that he speaks several languages, he is put to work as a Ttowierer (the German word for tattooist), tasked with permanently marking his fellow prisoners.Imprisoned for over two and a half years, Lale witnesses horrific atrocities and barbarismbut also incredible acts of bravery and compassion. Risking his own life, he uses his privileged position to exchange jewels and money from murdered Jews for food to keep his fellow prisoners alive.One day in July 1942, Lale, prisoner 32407, comforts a trembling young woman waiting in line to have the number 34902 tattooed onto her arm. 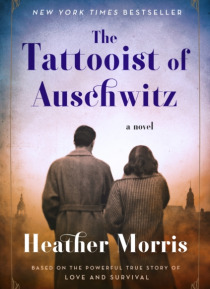 Her name is Gita, and in that first encounter, Lale vows to somehow survive the camp and marry her.A vivid, harrowing, and ultimately hopeful re-creation of Lale Sokolov's experiences as the man who tattooed the arms of thousands of prisoners with what would become one of the most potent symbols of the Holocaust, The Tattooist of Auschwitz is also a testament to the endurance of love and humanity under the darkest possible conditions.